Warhol died in the midst of completing the Camouflage edition. Consequently, the editioned prints of Camouflage prints are signed and stamped by Frederick Hughes, the executor of his estate. Since the 1980s, the Camouflage prints have continued to grow in popularity and significance, particularly with America’s continuing military involvement in the Middle East. 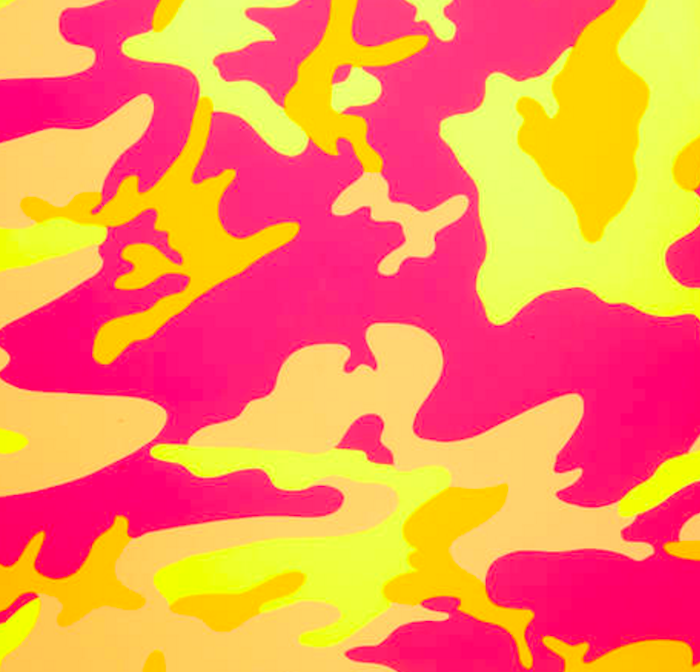 The fluorescent and vibrant colors of Warhol’s Camouflage gives the subject an almost humorous quality, considering the traditional use of camouflage for the uniforms of American armies. Considered by many as the most influential American artist of the second half of the 20th century, Warhol employed commercial silkscreening techniques to create identical, mass produced images on canvas with his signature style. Variations in color give each print of an edition a different and unique appearance. Warhol also created a self-portrait with a camouflage pattern around the same time. Andy Warhol was an American artist who was a leading figure in the visual art movement known as pop art. Andy Warhol’s works explore the relationship between artistic expression, celebrity culture and advertisement that flourished by the 1960s. Andy Warhol’s Marilyn and Andy Warhol’s Soup Cans are some of the most recognized and collectible of his artworks. From Andy Warhol Paintings to Andy Warhol Prints and unique pieces, the artist’s works are available for sale from Guy Hepner.Camouflage Print Portfolio by Andy Warhol are now avaialble.